We know your dog also deserves a decent meal every time. You can use one of the grinders recommended in this review to enjoy all these benefits. You will also save the time of rushing to the grocery every time to get meat. 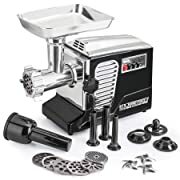 The best meat grinder under 300 will offer unparalleled grinding without breaking your budget. When choosing a meat grinder it’s advisable to check its features, strengths and shortcomings. 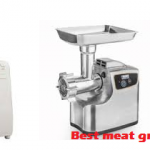 At times you want a powerful, space-saving meat grinder that will not break the bank. The LEM Products W777 .25 HP Grinder is among the most powerful and compact grinders that cost under 300. We have included this grinder in our review due to its proved performance. The design packs 180 watts induction motor featuring a start and run capacitor. This motor delivers enough power to make your home grinding a breeze. A built-in circuit breaker prevents motor ensuring the safety of grinding. All metal gears with roller bearings are meant to handle tough meat without breaking. 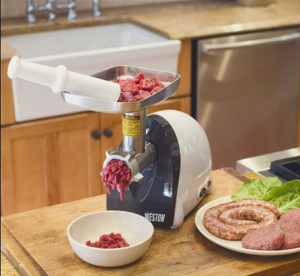 You are sure to continue grinding meat for long with this machine. The head is stainless steel for maximum grinding power. All stainless steel motor housing makes the motor functional and also prolongs the unit’s life. 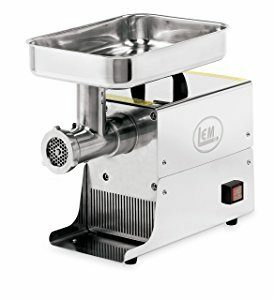 This meat grinder comes with a heavy duty handle enhancing the convenience of use. You can move the unit easily without any hassle. Get and grind instantly without any additional purchase. It comes with meat stomper, stainless steel cutting plates, and stuffing tube. A large steel meat pan is meant to hold your meat during processing. This grinding machine is ETL certified for quality grinding and safe operation. 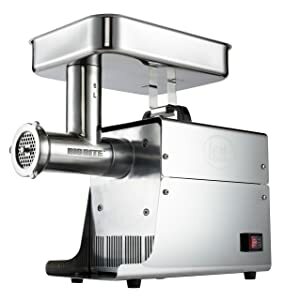 If you want to achieve professional grinding results, you want a commercial-style meat grinder. Such a machine should still be within your budget and suit your specific needs. The LEM Products W779A has become a popular model due to its speed and quality results. It allows you to grind about 7 pounds of meat per minute. It’s a good choice if you don’t like wasting time when processing meat for sausages or dog food. It comes with 3 stuffing tubes and 2 stainless steel plates for custom meat processing. You can use the steel cutting plates to process meat for soup, stew, sausages and more. Other components included with these equipment include meat stomper, stuffing plate, and a stainless steel knife. 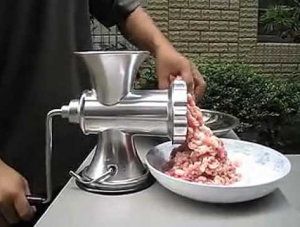 The grinding system bites large pieces of meat thanks to the Big Bite Technology. This technology is time-saving because you won’t have to cut very small pieces of when preparing meat for grinding. The machine doesn’t clog even if it bites large pieces of meat. The LEM Products W779A weighs about 36 pounds making it compact and more convenient to use than comparable models. The parts included with this machine are metal or stainless steel making them durable. If you want a fast grinding solution, grab this UL and ETL Certified machine. 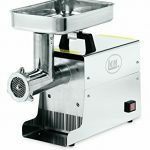 The STX-4000-TB2-PD – STX Turboforce II Meat Grinder combines style and performance. 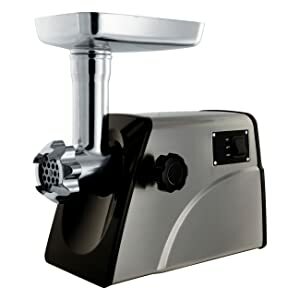 The design of this meat grinder will complement any kitchen; it comes in black and white with chrome accents. The motor features 2000W of peak output power which can grind tough cuts of meat without clogging the unit. It’s designed to grind the toughest home-grown and bush meat. Hunters can use the unit to improve the quality of their catch before selling it or for preservation. The three sausage stuffing plates help you to make all types of professional sausages at home. The 4 Air Cooling Intakes enhances ventilation during the grinding process. It comes with foot pedal control that allows for hands-free operation. Three speeds allow for quality grinding. Select the speed from low to high and reserve depending on your grinding needs. The reverse speed prevents the machine from clogging and also increases the volume of output. With this machine, you can grind about 175 to 225 pounds of per hour on high speed. This device has a stop and reset switch allowing for effortless operation. This meat grinder boasts of a weight of 13 lbs. The machine measures 19 inches by 8 inches by 14 inches. 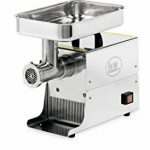 You can use for grinding meat at home and small commercial projects. If you have a relatively fixed budget, you can get the best meat grinder under $300. We have presented the best options available for you. 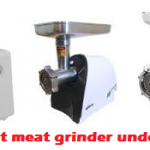 The 3 meat grinders reviewed in this post offer quality grinding and exceed your expectations. You can get one of the machines to improve your meat processing at home, for commercial purposes or making dog food. The grinder will help you to save time and money since you won’t have to get meat every day from the grocery.